When I was in college, a lot of people told me that they could see me living in Portland. While I ended up a few hours north (for now, anyway), Portland has been in the top three on my U.S. cities to visit bucket list (along with San Francisco and Chicago). Now that Steve and I have taken a trip there for the weekend, I’ll have to decide on a new city to round out my dream-visit-top-three, but I can definitely see why people could see me living there, and I’m already wondering when I might be able to go back! 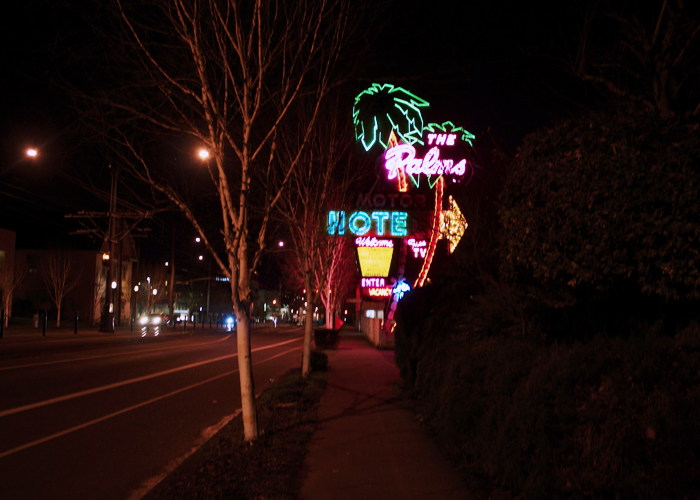 When we arrived, we checked into our lodgings, which was a classic roadside motel with a hilariously garish neon sign. It turned out to be the perfect location, right next to a MAX light rail line that would get us downtown, and only a few blocks from Mississippi Street, which we had been told was one of the best places to eat and drink. We decided to head there right away as we’d been driving all morning and seriously wanted some food. 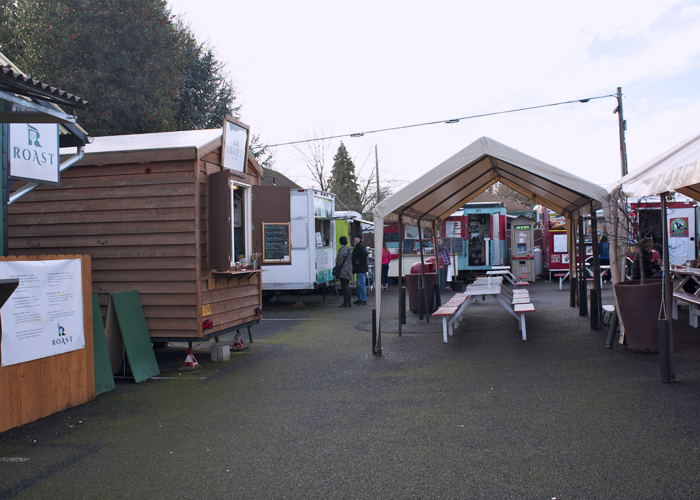 I’d been forewarned about the unbelievable number of food trucks, but it still took me by surprise. Apparently there are some 500 around the city—enough that you could eat at a different truck every day and not repeat yourself for over a year! We couldn’t be quite so ambitious, but we started off outside a cool German bar called Prost! with a kimchi and tofu cheesesteak sandwich from a Korean fusion truck and a pulled pork sandwich from a Southern style truck. We washed them down with a couple of German beers and we were on our way, walking down Mississippi and then all the way into downtown. After a few hours of wandering to get a feel of the city and the various downtown neighbourhoods, I decided it was time to go to the place that was the epicentre of my dreams to visit Portland. Explaining to Steve that if we wanted to visit some of the outer parts of the city, we might not want to come back downtown for the rest of the weekend, but that I was not going to miss my chance to visit this particular location, we made our way to Powell’s books. 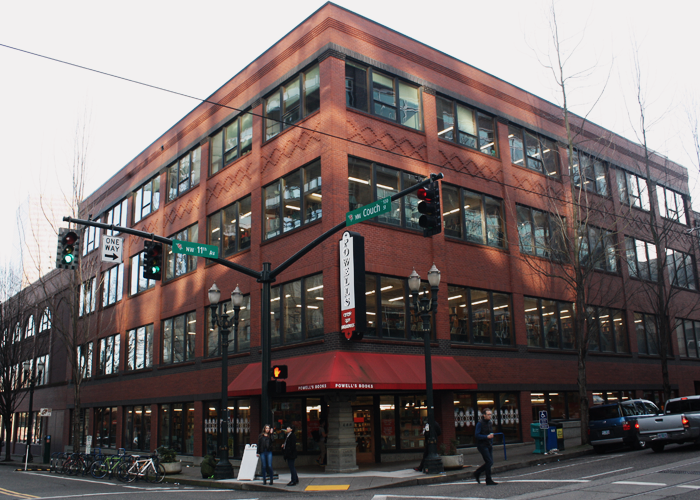 If books are a religion, then Powell’s is surely Mecca. Everyone I have ever asked about visiting Portland has told me that Powell’s is a must—as if it hadn’t already been at the top of my list. I went in determined to be… reasonable, let’s say, about the number of books I would purchase there, and I must say I did a pretty good job of sticking to my goal of a five-book limit (I bought six so, okay, one over isn’t too bad). However, I could’ve spent hours just poring over the shelves and seeing everything the shop, which stretches over nearly an entire block, has to offer. (if you’re curious, I ended up with Ignorance by Milan Kundera, Crazy Salad by Nora Ephron, Krik? Krak! by Edwidge Danticat, The Song of Achilles by Madeline Miller, Young Skins by Colin Barrett, and Black Oxen by Elizabeth Knox). Although I was sure nothing else could top Powell’s that night, we travelled on, once more in search of food and drink (I’d been told that those were the best things to do in Portland, and we found this to be true). We had a late-night snack at Voodoo Donuts, braving the queue that stretched out the door even at night, and then after another while longer walking, stopped into a pub. 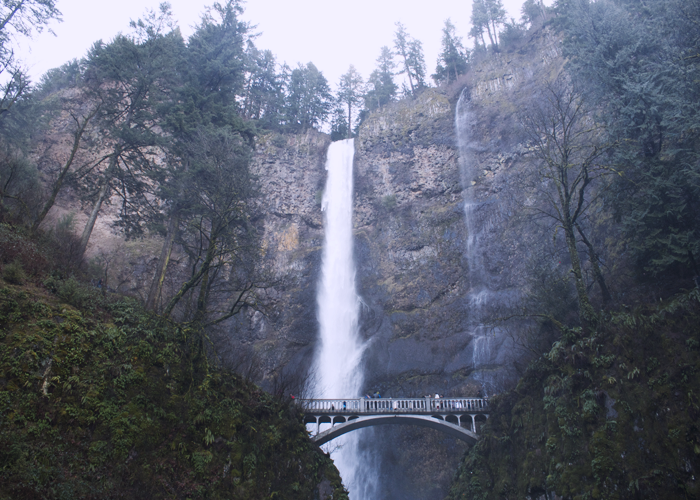 Oregon is known for its beer, having some of the biggest and best craft breweries in the United States. Although the most famous are not from Portland, several like Deschutes (from Bend) and Rogue (from Newport), have tasting rooms/pubs in the city. 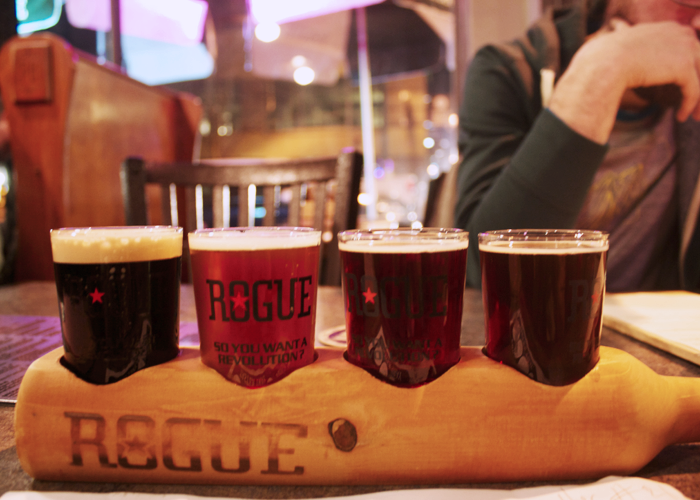 As Rogue’s Hazelnut Brown Nectar ale has been one of my favourites since I was introduced to it while in Galway, we chose to stop at their pub, and ended up each sampling a flight of beers. From left to right: Shakespeare Oatmeal Stout, Cold Brew IPA, Hazelnut Brown Nectar, Rogue Farms Fresh Roast. After that it was back toward our motel for some real food and then bed. 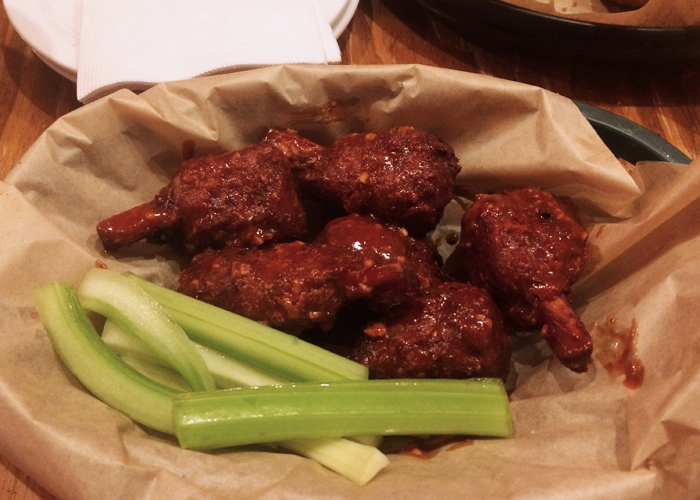 We chose Fire on the Mountain Brewery, having heard good things about their wings—and their vegan wings. I was happy about the amount of vegetarian and vegan food in Portland, more than I’ve ever seen in any city except perhaps Ithaca, although it came as no surprise. Having never had chicken wings even before I was a vegetarian, I was excited to try a vegan version that was apparently actually very good, though in the end I opted for the vegan drumsticks instead. I can’t really remember what chicken tastes like since I’ve only eaten a few bites over the last decade and a half, but these seemed right. The sauce was deliciously spicy, and the appetizer we ordered led to us fighting over the last onion ring, so you know it was good. Day two was similar to the first, except with more rain. We took cover from the storm at Olympia Provisions. Although the wait was unbearably long for some reason, the food was delicious when it finally came out. They’d been highly recommended so I’m sure it was just an off morning, speed-wise. We then headed down 23rd, another row of shops and bars, browsing through artsy treasures and, yes, eating more (Salt & Straw—I’m a huge fan of weird ice cream flavours, and though I chose the somewhat more normal coffee bourbon and honey lavender, I did sample an olive oil ice cream that was surprisingly delicious). After 23rd it was on to yet another neighborhood, this time Hawthorne, for more browsing through packed antique shops and marveling at the selection of food trucks. We passed a bar called 4-4-2, adorned with paintings of soccer balls, and couldn’t resist stopping in for a pint. If only we’d known about it that morning and could’ve gone to watch the EPL matches! Still, we were able to catch the second half of the USWNT v Ireland WNT game (the USA crushed the girls in green 5-0). We then took the bus north to the Alberta Arts District, where there were—no surprise—more pubs and restaurants to be found. It was getting late, so the shops were closed, but we had a few pints and eventually ended up at a not-so authentic Irish Bar called the County Cork Public House. Still, the fish and chips was yummy and they had a dart board so it was an enjoyable place to continue the evening. We finished up with a drink at Ecliptic Brewing back on Mississippi and then, exhausted, went home to bed. We had an early morning and a long drive back up to Seattle ahead of us. 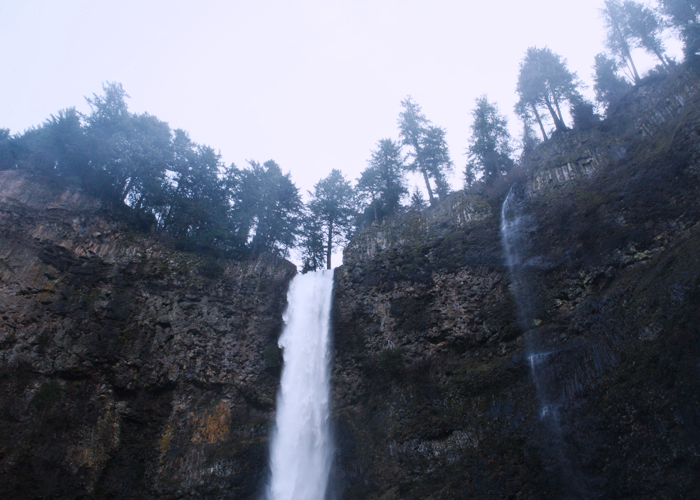 Waterfalls are probably my favourite aspect of nature, so I knew we had to stop at Multnomah Falls before heading back to Seattle. It was about a 45-minute drive outside of the city, and we crossed our fingers that the rain, which had held off for most of the weekend apart from Saturday morning, would stay away just a bit longer. 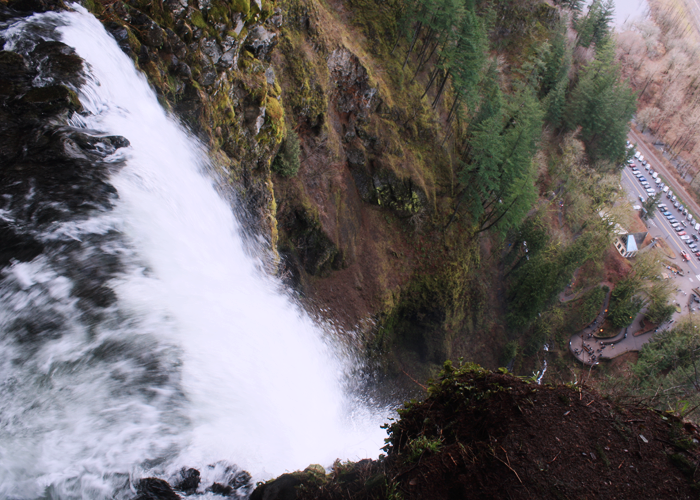 We arrived at the falls to threatening clouds but no precipitation yet, and we were amazed by the height and power of the water that flowed over the rocks and down toward the Columbia River. The path was about a quarter of a mile walk to the bridge that crossed in front of the falls and we traversed this with ease, stopping to marvel and get fairly drenched by the spray. The rest of the trail up to the top of the falls, another mile at least, was much more arduous. “Surely we must be nearly at the top,” I thought, before reading the sign: “Switchback no. 4 of 11.” Sigh. Still, when we reached the top, the view was certainly worth it, as was the view of the waterfall from above as it tumbled down to the pool and river below. 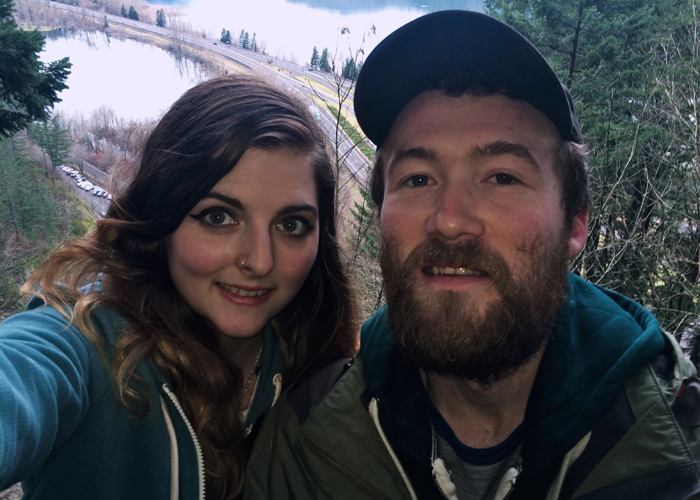 We tried fruitlessly to take selfies in which both we and the background were visible (at least we look cute, right? I promise there’s an amazing shot of the river just behind us… you just can’t see it). Eventually someone took pity and offered to take one of us. The rain started just as we reached the bottom of the trail again, and our time in Oregon ended as we returned to the car and made our way back to Seattle. 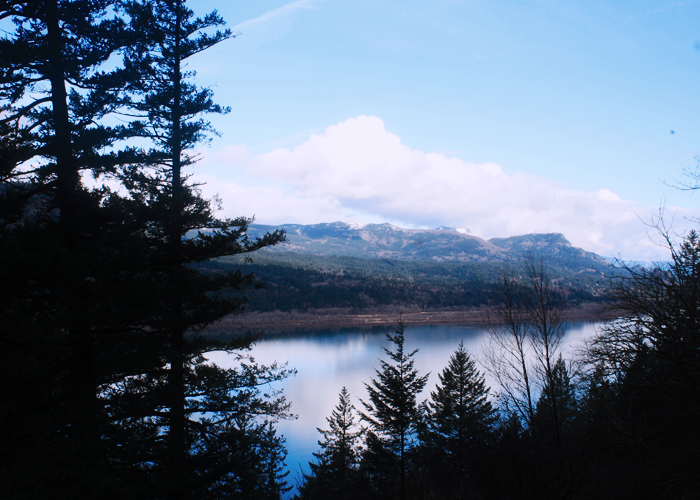 See you again, Oregon, for sure. Previous Post To-do list: now ’til Tuesday?